Slipknot frontman Corey Taylor is responding to news reports linking his band to a sword rampage at a South African high school on Monday that left one teenager dead and three other people seriously injured. 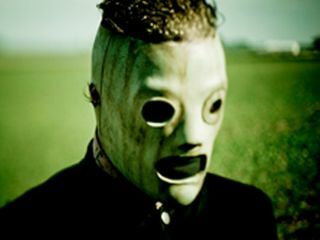 According to South Africa's The Times newspaper, the perpetrator was wearing a homemade mask modeled on the one worn onstage by Slipknot drummer Joey Jordison. "Obviously, I'm disturbed by the fact that people were hurt and someone died," says Taylor. "As far as my responsibility for that goes, it stops there, because I know our message is actually very positive. I'm not encouraging anybody to kill anybody. I encourage our fans to express themselves, to stick together and to help each other." Morne Harmse, 18, is accused of stabbing to death Jacques Pretorius, 16, at the Nic Diederichs Technical High School in Krugersdorp, outside Johannesburg, as well as injuring Stephan Bouwer, 18, and two gardeners. Assailant listened to "Satanic music"
Witnesses came come forward, claiming that Harmse listened to "Satanic music" by Slipknot before the attack. Police found three more swords in his bag, alongside four additional masks resembling those worn by band members such as percussionist Shawn "Clown" Crahan and DJ Sid Wilson. Nevertheless, Taylor rejects blame for the incident: "You have something like this happen, it could have been Marilyn Manson, it could have been any number of people who make art that is startling visually, on the darker side. It could've been Pat Boone. At the end of the day, there are always going to be mental disorders and people who cause violence for no other reason than the fact that they're fucked up and lost. And all we can do is try to learn from it."